William Blizzard Williamson, the elder was born in Cork, Ireland in about 1812. He appears in the English Census of 1841 in Kingston (upon Thames) described as an “I tinman” (possibly itinerant tinman – or tinker). When he died in 1878 he had founded the Providence Tinplate works in Worcester (later a major part of Metal Box) and both his sons would go on to be Mayor of Worcester. It is said that William Williamson, his wife Elizabeth and eldest son, William Blizzard (the younger, born in Cork in 1840), left Ireland due to “religious persecution”. In England their descendants appear to have been Church of England (and the men were probably Masons), so one might suppose that they had previously been Church of Ireland or possibly Presbyterian. William Blizard Williamson was a Congregationalist when he died. Whilst we do not know the exact cause of this persecution, at the time in Ireland a number of issues were prominent including campaigns against the tithe, against the Union (with Great Britain) and for Catholic Emancipation. However, it may have been prejudice against tinkers – if the interpretation of “I tinman” is correct. I have recently seen (Reader 1976, citing Williamson, G.E.) a reference to “The business founded before 1854 by a Plymouth Brother of obscure Irish antecedents, described by his grandson as ‘a Card’, …”. This opens up another explanation for “religious persecution”. The Brethren had their origins in the late 1820s in Dublin and Cork (in Ireland) and in Plymouth, England (where like-minded people were found in 1831). The separation of Church and State, together with a desire for a purer form of worship seem to be behind the founding of the Brethren. From the earliest days (even before the open/exclusive schism in 1848) , the Brethren seemed to be separatist (keeping apart from an immoral world). It is therefore possible that someone described as ‘a Card’ might have been “withdrawn from” (expelled/shunned) by the Brethren – and this may be the source of “the persecution”. Given the family’s later involvement in the packaging of tobacco I cannot imagine that he was persecuted because of adherence to Brethren principles. William Blizzard Williamson who came from Wolverhampton and set up next to the canal at Lowesmoor around 1855 making milk churns, baths, domestic metalware and cash boxes, etc. The Providence Works was established in 1858 in Providence Street filling the block to Charles Street where offices where built. Whilst the works is no more, the offices still exist (as Williamson House) with stonework above the entrance proclaiming “Williamson & Sons Established 1858”. The 1861 Census shows the family at Sedbury Street in Worcester; William the elder, wife Elizabeth, sons William the younger and George, a nephew Thomas and a boarder Joseph Morgan. 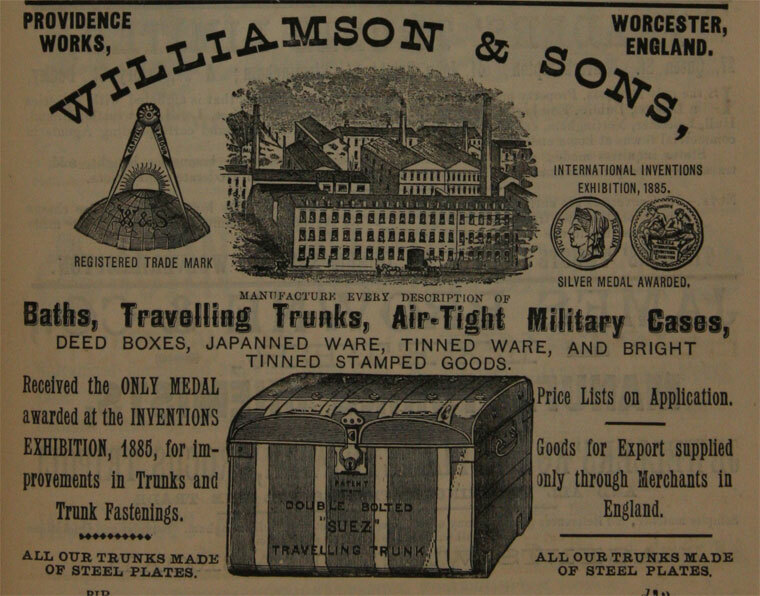 William is listed as a tinplate manufacturer employing 3 men and 4 boys. All the other men are listed as tinplate workers. It is probable (based on later census records) that William’s and George’s ages were transposed. The nephew Thomas is listed as born in New Jersey, USA. William Blizzard (the elder) died in 1878 (at Worcester) and the two sons William Blizzard (the younger) and George Henry took on the company until 1890 when William left the company, and the business became G.H. Williamson & Sons. In 1930 the company merged with Metal Box, George Henry having died in 1918 and his (only) son George Evans having continued as a director. George Evans qualified as a barrister prior to the Great War (in which he served according to the Worcester Masonic Lodge’s Roll of Honour) and lived in Wimbledon; however in 1928 a patent was filed in the names of; Williamson & Sons. Ltd., G., H., Valor Co., Ltd., and Williamson, G. E. which would imply that he was taking an active part in the business. In 1931, Metal Box opened its Perry Wood site (with its entrance now on Williamson Road, Worcester), to make food cans; it is still in operation today, although the Metal Box packaging business is now part of Crown (see diagram below). The Providence works, continued (making items such as the decorated kitchen tinware known as Worcester Ware) closing in the 1960’s and there is now a telephone exchange on the site. Barlow was now the head of Britain’s canning monopoly and determined to make it even larger. But his aggressive managerial style alienated most of the old family leaders of the group’s companies, and many resigned from the board of directors. Barlow wanted to bring all member companies under one authority and ignored those on the board who opposed him. He set up an executive committee with two others, Hepworth and Crabtree, to make policy decisions and, essentially, to circumvent the board. Apart from their tin-making, both the second generation brothers were elected Mayor of Worcester (William, the younger in 1883 and George Henry, in 1893). The Worcester People & Places website also reports that George Henry Williamson was chairman of the Streets Committee and was responsible for the widening and remodelling of many of the cities streets. (Worcester People & Places, 2010b) He was also the Conservative Candidate in the notorious 1906 General Election, when he was disqualified following allegations concerning bribing the electorate (see separate story). I am at present reading a book written by George Evans Williamson, entitled ‘Opening the Door’ (spiritualism). I have not found another copy on the internet, even though I don’t consider it that old (1964); published by Regency Press, London. The dust jacket gives some details of him, I can supply a bit more if interested. Born January 1885, educated Rugby school and Cambridge. Practised 5 years as a barrister, joined the army in 1914. on his release entered the family business. Eventually the business became merged in the Metal Box Company. In 1934 went to south Africa in charge of the Metal Box company’s interest there. The book tells the story of how he met his wife who was a natural psychic, and their quest to find out more about the meaning of life. Thanks for this angle which I have not come across before – I will keep an eye open for the book. George Evans Williamson married twice; can you confirm which wife you are refering to? Does the book give any indication of which unit he served with in the Great War – Rolls of Honour at Worcester reveal that he did, but do not say which unit. Two items are not accurate. The 1931 Metal Box factory is on Perry Wood Walk, the Williamson Road entrance was opened early 1990’s. The Providence Works building can still be seen and is next to the telephone exchange. Thanks for the information about the original access to the Perry Wood factory – I have amended the wording. I have added a StreetView link to my reference to the Providence Works Offices – opposite the telephone exchange on Charles Street. However I can find no evidence (via Google maps) that any other part of the works remains. http://www.worcestercitymuseums.org.uk/coll/object/oldobj1/obfeb.htm reports that part of the works was partly demolished to be replaced by the telephone exchange – which together with BT offices seems to fill the block between Providence Street and Charles Street. http://www.worcestercitymuseums.org.uk/mag/spirit/engin/spe3.htm shows a part view of the works (the block south of Charles Street). The office building is the only bit that appears to remain – the other buildings appear more modern. Is the building on the East side of Foundary Street (“Bathrooms and Boilers Direct”) part of the old Providence Works? I have come across one or two of your on-line posts re the Williamsons, and before forgetting about it wanted to let you know that my mother did mention to me years and years ago that the Williamsons may originally have been tinkers. It is possible she heard this somewhere, as I don’t think she would have come up with the idea if she hadn’t. I have no proof of it, though! There is some story, which you may already know, that an early Williamson (I don’t know if this would have been William Blizard the elder, or his father) ran off to London from Liverpool, and that his wife pursued him with the family and obliged him to face up to his responsibilities. I see that my great-grandfather George Henry, was born in London, and his brother in Cork, so it may simply be that Wm Blizard did go from Liverpool to London, but that the story has been embroidered upon over the years. Another thing that you may or may not know, but there was an “Aunt Evans”, and George Evans was presumably named after her. My mother has Aunt Evans’s desk, which she still uses. Who she was exactly, though, I don’t know. A last thing – I see that Blizard or Blizzard is spelled with one Z or two, but I think that one Z is the original spelling. Blizard seems to be a west of England name, so it’s not unlikely that there was a Blizard Great X3 or X4 granny in there somewhere. Could be a clue for future use, but you’ve probably worked that one out for yourself already. David, I forgot to mention : my mother’s version of the persecution in Ireland goes something along the lines of one of the family, William as a young man, or one his family, being set upon and called a “filthy Protestant” and left for dead. >>privacy edit<< My grandfather had a wonderful memory for anecdotes and detail, and knew all these stories - I should have taken much more notice at the time! Sadly Production at the Perrywood site will cease on 28th June 2013. The work being moved to Neath and Wisbech. Nevil. (ex Employee as of 2 hours ago). Sad news after more than 150 years in Worcester. Good luck to you and your former colleagues. Hello David, I don’t know whether you heard back from Ian about the two wives of George Evans Williamson, but I seem to remember my mother telling me that it was Rita who was interested in spiritualism.